Week 2 is now in the books and let's not wait to use the wavier wire. Every year you need to be all over the waiver wire if you are going to make it to the play-offs. Here are the QB, RB, WR, and TE waiver wire week 2 pick-ups to start building up your bench. 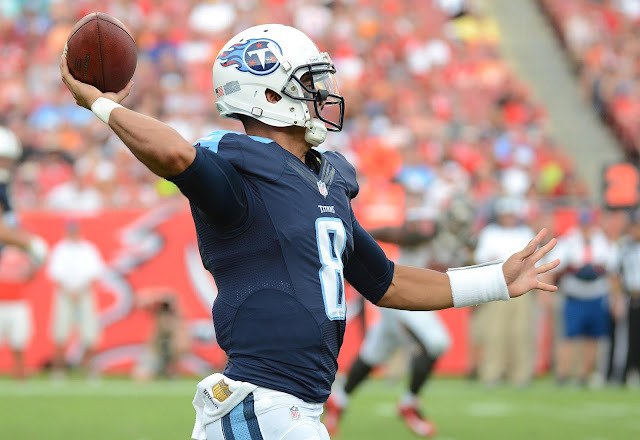 Marcus Mariota (QB, TEN) - he looks sharp and poised; if he happens to be on the waiver wire then he is a solid QB pick-up. I venture to say that he looked so sharp this weekend that I may be willing to go out on a limb and say he could be a potential top 10 QB in 2015. Kendall Wright (WR, TEN) - he should not be on your waiver wire, but if he happens to be available then you need to pick him up. Stevie Johnson (WR, SD) - he better not be on your waiver wire; I wrote up an article on him during the off-season explaining that he has solid upside on the Chargers offense as Phillip Rivers will be throwing the ball frequently. James Jones (WR, GB) - Coming back to Green Bay was huge for Jones and he found the end-zone a couple times this weekend with Jordy Nelson gone for the year. He is a must grab in a high-power offense. Bishop Sankey (RB, TEN) - had a solid outing and Terrance West looked mighty slow out there. He should be grabbed and used in a spot-starting type role. Terrance Williams (WR, DAL) - with Dez Bryant out for four to six weeks Terrence Williams will step up in a big way. He is an easy pick-up and spot-starter going forward until Dez returns. Delanie Walker (TE, TEN) - even before Mariota was the QB, he was a solid TE, so he is going to shine this year with a solid QB. Keep an eye on his hand injury as he could miss action next week, but still a TE to stash even if he is injured. Tyler Eifert (TE, CIN) - another player that probably won't be on your waiver wire, but he is a huge target for Dalton in the red-zone. He is a solid TE pick-up going forward. Donte Moncrief (WR, IND) - appears that Moncrief will be the WR3 in Indy and could be a PPR sport-starter fill-in. We need to see a couple more weeks before we get too much confidence, but Moncrief is someone to target in larger leagues. If you are a TY Hilton owner you should be targeting him just in case Hilton misses any time with injury. Danny Woodhead (RB, SD) - if you are in a PPR league and need a spot-starter the Chargers will continue to lean on Woodhead through the air. If you are in a TD only league he is used at the goal-line as well, so he is an all-around solid pick-up regardless of your format. David Johnson (RB, ARZ) - with Ellington's injury I believe we will actually see David Johnson emerge as the primary back in Arizona, but it will take several weeks, but he is a RB to stash right now. Chris Johnson (RB, ARZ) - with Ellington's injury Chris Johnson got a large amount of work and will continue to see carries weekly. He is a must grab going forward. Dion Lewis (RB, NE) - if Legarrette Blount doesn't look as fresh as people are hoping then you may see a healthy dose of Dion Lewis for 2015. He looked sharp and shifty as well as making catches out of the back-field. If you are in a PPR league there is huge upside in Lewis and becomes more of a must grab player. Alex Smith (QB, KC) - could this be the year Smith actually throws TD's into the end-zone. Well so far so good, but for now he remains a spot-starter with upside. Lance Dunbar (RB, DAL) - he had a solid outing this weekend in the comeback victory and with Dez on the sideline you can expect Dunbar to keep catching passes. If you are in a PPR league Dunbar presents upside. Jordan Reed (TE, WAS) - he is a huge target for the Redskins and has incredible upside going forward. If you are looking for a solid week to week TE then look to Reed who should be able to deliver. Benny Cunningham (RB, StL) - if Tre Mason is out again next week and you are in a PPR league then you can spot-start Cunningham if you need him. Ronnie Hillman (RB, DEN) - split carries and outdid CJ Anderson; he will continue to get weekly work and if he continues to run hard he will steal more and more carries from CJ. Pierre Garcon (WR, WAS) - if you are in a PPR league then Garcon should see around five to eight catches a week in an offense that will need to throw the ball. Karlos Williams (RB, BUF) - he is playing behind Lesean McCoy and looked solid. If you are a McCoy owner it is good to stash Williams if you have the space available. Dwayne Allen (TE, IND) - if TY Hilton misses time next week then look to Allen to pick-up some slack. Allen has more appeal in TD only leagues. Deangelo Williams (RB, PIT) - as long as Bell is on the sidelines then Williams is a nice spot-starter with upside. He ran hard this weekend and looked to be in good form. If you are a Bell owner then use Williams as a hand-cuff. Ryan Mallett (QB, HOU) - he will most likely start in Week 2, but he is not a QB that you are going to run out and grab to start. Cole Beasley (WR, DAL) - with Dez sidelined for six weeks expect Beasley to have only single coverage and pull-in roughly four to six grabs a week. He has some upside, but not my favorite WR pick-up this week. Jermaine Kearse (WR, SEA) - PPR league owners only apply, but Kearse will be up and down weekly, but with eight receptions this week he can't be ignored. Tyrod Taylor (QB, BUF) - he didn't look too bad this weekend and he should be a QB that you monitor for now unless you are in a two QB league and need the depth. Tyler Lockett (WR, SEA) - he looked sharp this weekend against the Rams and if you league gives return yards he has a nice bonus to his weekly points. He should continue to get more work weekly and is someone to stash only if you have room. Austin Seferian-Jenkins (TE, TB) - he is a large red-zone target for TD only league players who need a spot-starter. He had a solid weekend this week, but he is not going to be very consistent. Percy Harvin (WR, BUF) - so Tyrod Taylor had no problem looking Harvin's way; you can't expect too many TD's from Harvin, but he could be a spot-starter and bye-week fill-in. Buck Allen (RB, BAL) - this is only for dynasty league owners, but Allen looked sharp and had some juice. If you are in a large league and have space on your bench then you can stash him. Nate Washington (WR, HOU) - only someone to watch in PPR leagues as Houston will be playing from behind a good amount this year. He is only someone to watch in super deep leagues. Allen Hurns (WR, JAX) - could be a PPR potential on a team that will need to throw the ball a good amount this year. Keep a close eye on Hurns. Khiry Robinson (RB, NO) - He filled in for the injured CJ Spiller, but when Spiller returns Robinson will lose carries and catches. He is only worth considering if there are future injuries on the Saints. Jerricho Cotchery (WR, CAR) - Cotchery finds a way to get in the red-zone every year and if you are in a TD only league then you have to keep an eye on Cotchery. Brandon Coleman (WR, NO) - he is a huge target for Drew Brees but he is still the WR3 on the Saints so he is not going to be consistent from week to week but he is a WR to keep a close eye on. Eric Ebron (TE, DET) - he had a solid outing this weekend, but he will not be consistent enough to start from week to week. Marquess Wilson (WR, CHI) - he is a young player that could emerge this year; he is not someone to go crazy about, but for now he is a player to keep a close eye on. Marcel Reece (RB, OAK) - his two TD's came in garbage time, so he is not a grab right now. Rashad Greene (WR, JAX) - solid rookie first game and someone to keep a close eye on for the season. Ladarius Green (TE, SD) - performed solidly while Gates is out, but only has upside while Gates remains out.